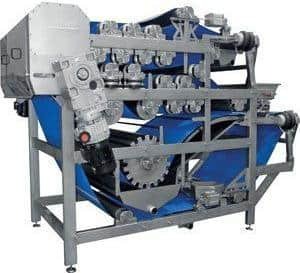 The automatic DOUBLE BELT PRESS K2B is designed for the extraction of juice from produce including: apples, pears, quinces,, berries, watermelon and vegetables. The fruit or veg. will be washed in a Kreuzmayr elevator/washer prior to pressing, which transports it up to the centrifugal crusher. 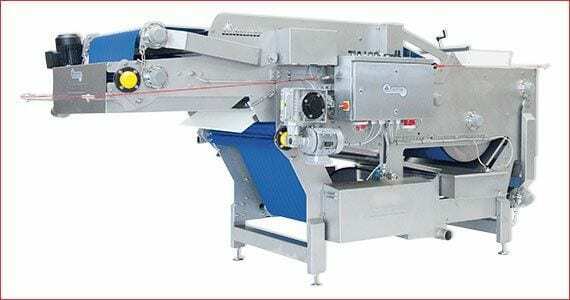 The fruit pulp (mash) is discharged onto the moving press-belt. An automatic control prevents the pulp inside the hopper from over ﬁlling. Stone fruit like cherries, plums, apricots or peaches need to have their stones removed with a destoning machine (KEP 1500 or KEP 2500) in order to produce a fragment free pulp ready for belt pressing. The Double Belt Press is delivered ready for production, once it is set up in it’s new location. The Double Belt Press can be adapted to different fruit and vegetable types as the belt speed and press force can be adjusted as needed. The machine is simple to clean after the work process, easily done by one person. The mash deﬂectors can be easily removed (no tools are needed). The pulped mash is conveyed via the Elevator/Washer/Grinder or a Mash Pump into the press hopper via an application and dosing station (here the width and the height can be adjusted) the mash is going to be continuously applied on the belt. This pre-pressed mash is going to be optimized for the main pressing zone. The mash is transferred over the main pressing roller to progressively smaller rollers for optimum juice yield. 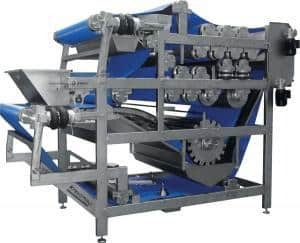 At the exit of the press, the pomace (mash) will be automatically scraped and the belt will be cleaned by a high pressure water jet cleaning device. This continually removes any remaining pulp particles from the press-belt, so that the belt is clean and ready to continue its pressing cycle.